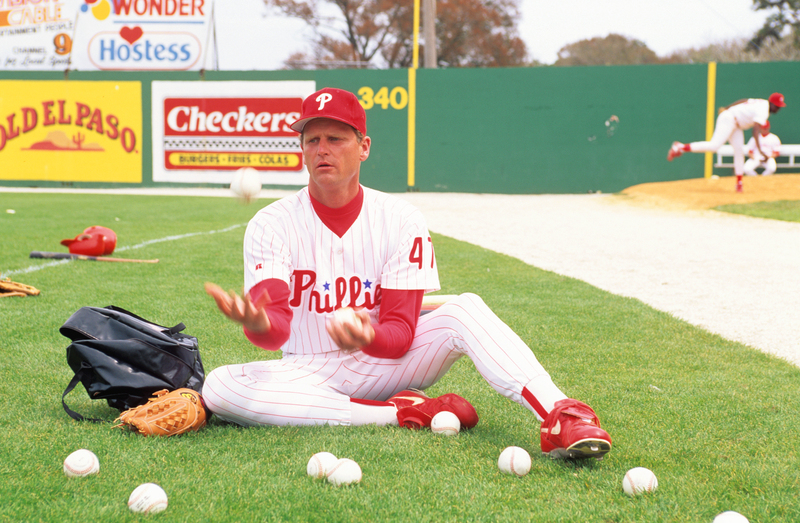 Larry Andersen is a five-tool talent: big-league relief pitcher, member of two Phillies pennant winners, one-time minor league coach, currently a Phillies broadcaster and master of shallow thoughts. **auditioning as a juggler for the circus. **getting a feel which baseball has the right feel. **occupational therapy homework in an effort to be better coordinated. **trying to get on the cover of Sports Illustrated. **showing off for pitching coach Johnny Podres. Sitting in a bullpen for 17 years in the majors gave “LA” plenty of time for creative thinking. Here are his latest shallow thoughts. If it’s a penny for your thoughts, why does everyone put their two cents in? If the plural of tooth is teeth, is the plural of booth, beeth? If a cab drives in reverse, shouldn’t I get money back? If a visiting player hits it, why is it still called a HOME run? If I go 1 for 1 I’m batting 1.000, so if I go 2 for 2 am I batting 2.000? If a guy is a good fastball hitter, should I throw him a bad fastball? “Hitting is timing. Pitching is upsetting timing,” Warren Spahn. “Baseball is a drama with an endless run and an ever-changing cast,” Joe Garagiola. “Baseball ain’t like football. You can’t make up no trick plays,” Yogi Berra. “Good pitching will always stop good hitting and vice-versa,” Casey Stengel. “The catcher is padded like an armchair,” London Times. Since the Carpenter family purchased the Phillies after the 1943 season, there have been five presidents of the ball club. Yesterday the Phillies announced that President and CEO David Montgomery is returning from a medical leave of absence and assuming a new role as the Chairman, Bill Giles is now Chairman Emeritus, and Pat Gillick will continue his current position as President. Three other presidents since 1943 were Bob Carpenter, Ruly Carpenter and Giles. That’s amazing stability at the top. Other Philadelphia sports franchises can’t come close. David’s legacy is a pretty impressive one: five division titles, two World Series appearances, a World Championship and two new ballparks, Citizens Bank Park and Bright House Field. Everyone in the organization is looking forward to having David around daily. Fan voting for the Toyota Phillies Wall of Fame began on Friday. Voting ends on February 6, 5 p.m. Vote as often as you like. 12 Phillies legends are on this year’s ballot. Alumni Weekend will take place July 30-August 2: Alumni Luncheon for Seniors on July 30 noon; Wall of Fame induction on Friday, July 31; Toyota Alumni night on August 1 and still to be determined are Sunday’s events, August 2. Appearing on the ballot for the first time is outfielder Pat Burrell. Today: RHP Gavin Floyd (32), LHP Mike Zagurski (32) . 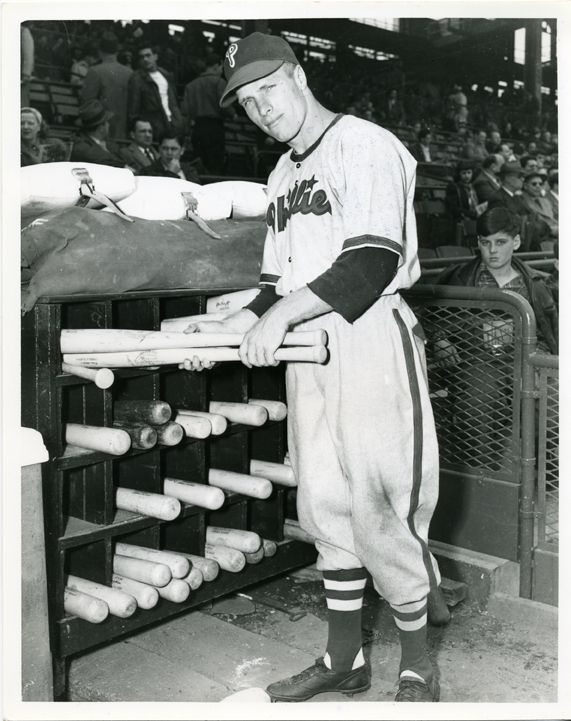 . . Wednesday: 1B Bill White (81) . . . Friday: CH Joe Kerrigan (61), 2B Davey Johnson (72) . . . Saturday: RHP Joel Bennett (45) . . . Sunday: RHP Bob Conley (81) . . . Monday: RHP Warren Brusstar (63). To the family of Ray Rippelmeyer on the passing of a beautiful person, his wife, Glenda. Ray was the Phillies pitching coach, 1970-78. In respond to a post by Ed, Phillies Alumni Day in Clearwater will take place on Saturday, March 21. Deflated footballs? Baseballs are never deflated. RF Oscar Gamble got the last hit at Connie Mack Stadium in 1970 and LF Pat Burrell, the final hit at Veterans Stadium in 2003. Reader Skip (Memory Lane) Clayton pointed out Richie Ashburn’s batting title was omitted from the anniversary moments to be remembered in 2015. He was right. So, here’s to Whitey’s title 60 years ago. He finished with a .338 average, easily beating Willie Mays’ .319. Going into the final day of the season (September 25), Ashburn led Mays, .342-.319. The final day was a double-header between the Phillies and Giants at the Polo Grounds. Ashburn went 0-7, Mays 4-8. Three years later Ashburn won his second title, .350 to Mays’ .346. It’s the last Phillies batting champion. Check out many more memorable moment anniversaries at http://www.phillies.com/alumni. Tuesday: LHP Matt Beech (43), RHP Brad Brink (50) . . . Wednesday: RHP Mike Krukow (63) . . . Thursday: INF Ramon Aviles (63) . . . Friday: RHP Brandon Duckworth (39), RHP Frank Sullivan (85) . . . Sunday: 1B Francisco Melendez (51), INF Ted Kazanski (81) . . . Monday: 3B Rick Schu (53), C Bob Uecker (80). 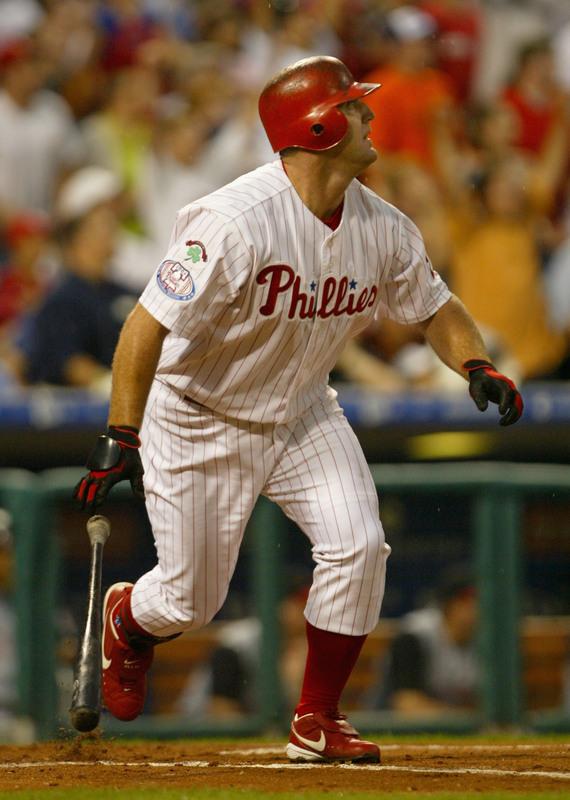 Jim Thome hit 101 home runs for the Phillies and one against them. He hit the last home run at the Vet and his 400th at Citizens Bank Park. His last Phillies homer was the 13th walk-off home run of his career, an MLB record. Heading for Clearwater so the next post will be January 27. Spring training #52 coming up. Four days of the Phillies Prospect Program got underway today. New RHP Ben Lively has joined RHP Aaron Nola, SS JP Crawford, CF Roman Quinn, LHP Tim Windle, RHP Zach Eflin, LHP Joely Rodriguez, RHP Severino Gonzalez, RHP Neifi Ogando, and OF Cameron Perkins. Lively actually replaced Hector Neris who is remaining in winter ball, 0 runs, 18 innings over 20 appearances in the Dominican League. Lively, Windle, Eflin and Rodriguez were all acquired in trades this winter. This week will be their official welcome. By being in the program, they’ll now know some faces when spring training begins next month in Clearwater, easing the anxiety of walking into a new clubhouse. They also get to see Citizens Bank Park and where they hope to have their own locker someday. Among the guest speakers are Pat Gillick, Ben Davis, Charlie Manuel, Anthony Gargano, Jim Salisbury, Jayson Stark and Dickie Noles. Others who will participate include Joe Jordan, Mike Ondo, Bonnie Clark, Dave Buck, Ruben Amaro Jr., Ryne Sandberg, Frank Coppenbarger, Scott Sheridan and Shawn Fscani. Tomorrow the group will tour the MLB Network Studio in north Jersey. Friday morning starts with a breakfast gathering of season ticket holders followed by a leadership roundtable discussion involving Larry Andersen, Larry Bowa, Mickey Morandini, Dave Hollins and Darrel Daulton from the 1993 NL champions. A couple of blogs ago reader Jim Peyton inquired as to which roster Joely has been placed. Joely has been added to the 40-man winter roster. Wednesday: RHP Paul Fletcher (48), INF Derrell Thomas (64), INF Ron Clark (72) . . . Thursday: RHP Wayne Gomes (42) . . . Saturday: C Tyler Houston (44), 2B Denny Doyle (72) . . . Sunday: C Mike Lieberthal (43), INF Billy Grabarkewitz (69), CH Chuck Cottier (79) . . . Monday: RHP Amaury Telemaco (41), RHP Jeff Juden (44), CH Brad Mills (58). 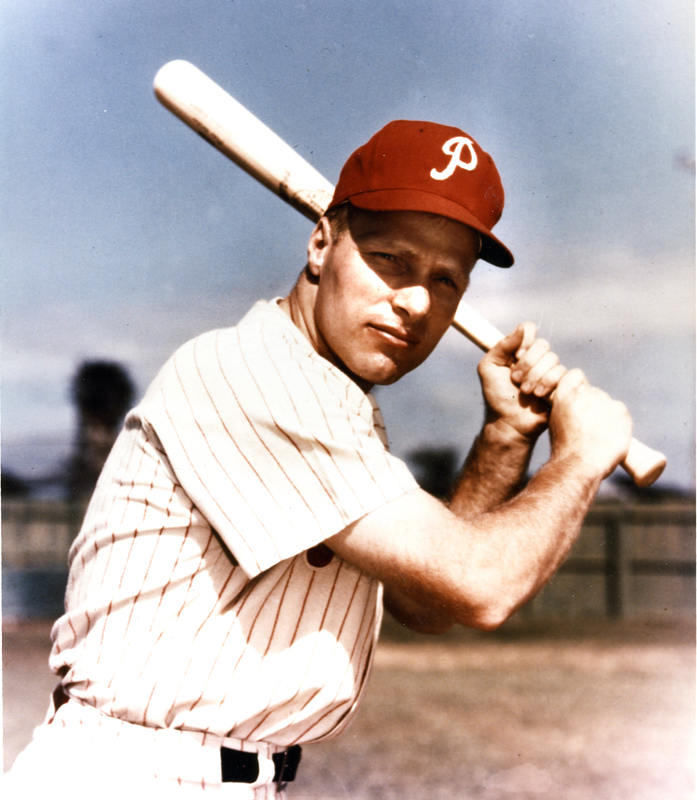 During Phillies career, Robin Roberts won 20 games or more six straight seasons starting in 1950 and worked over 300 innings each of those seasons. Even more amazing, he completed 272 of his 472 starts. Congratulations to the new Half of Famers. Certainly some quality inductees come July in Cooperstown, NY. Should be another great weekend for baseball. Pedro ended his brilliant career pitching in nine games with the Phillies in 2009, 5-1 record. It will be interesting to see which cap he chooses for his HOF plaque. Probably Boston where he won 117 of his 219 career games. The Lehigh Valley IronPigs sent out a neat tweet last night: “We assume his plaque will have him in an IronPigs cap but nothing confirmed at this point.” Pedro pitched in one game for them in 2009 before joining the Phillies. Pedro wore #45 for most of his career, including the Phillies. While the Phillies retire uniform numbers of their players who are Hall of Famers, that will not be the case with Pedro. He’s in the category of numerous other Hall of Famers who wore a Phillies uniform. To name a few, Eppa Rixey, Davey Bancroft, Casey Stengel, Joe Morgan, Tony Perez. They all earned their spurs with other clubs. Pedro’s post season record: 14 starts: 6-4, 3.46, 96.1 innings, 96 strikeouts. Cole Hamels: 13 starts, 7-4, 3.09, 81.2 innings, 77 strikeouts. Phillies Phancation departs for Riivera Maya, Mexico, on Sunday and returns Friday. Justin DeFratus, Tommy Greene, Greg Luzinski, Scott Palmer and the Phanatic will be on the trip with fans. Next week, Tuesday through Friday, the team’s annual program for young players will take place at Citizens Bank Park. Group this year includes Aaron Nola, JP Crawford, Roman Quinn, Tim Windle, Zach Eflin, Hector Neris, Joely Rodriguez, Severino Gonzalez, Neifi Ogando, and Cameron Perkins. There’s a vintage photo from the 1950s of Phillies broadcaster Gene Kelly and four players on http://www.phillies.com/alumni. Mike Lieberthal has caught the most games in Phillies history. Who’s second? After 12 years in a Phillies uniform and a club-record 2,217 hits, OF Richie Ashburn is traded to Chicago Cubs for INF Al Dark, 3B Jim Woods and RHP John Buzhardt[SL1]. Ashburn played two years with the Cubs, 1963 with the Mets and retired. Happy New Year. And, it is a happy one. The biggest collapse in Philadelphia sports history no longer belongs to the 1964 Phillies. Instead, the 2014 Eagles. January 2: RHP Garrett Stephenson (43), C Jim Essian (64) . . . January 3: C Darren Daulton (53) . . . January 4: LHP Ken Reynolds (68), Charlie Manuel (71) . 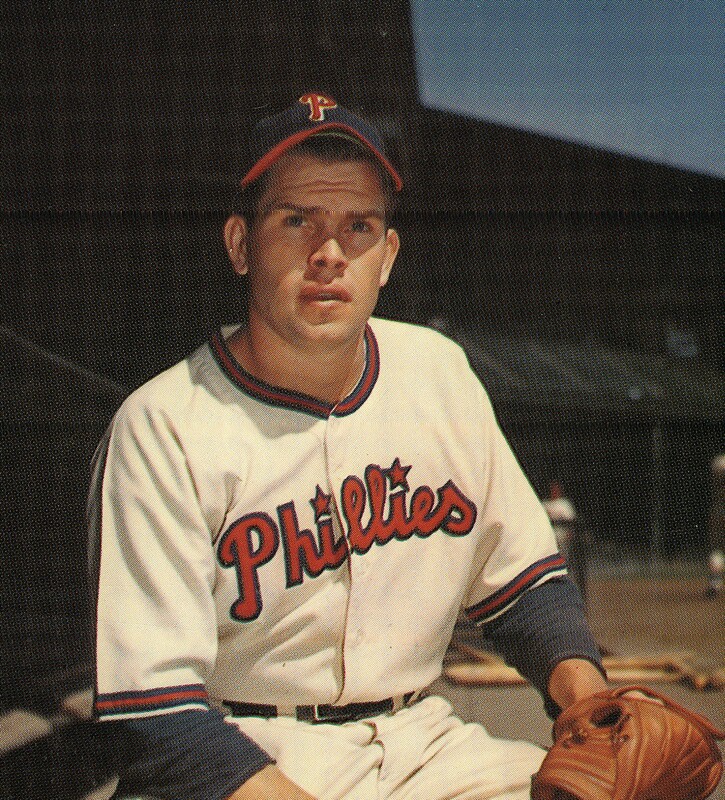 . . January 5: LHP Danny Jackson (53), C John Russell (54), OF Milt Thompson (56), OF Bobby Dernier (58) . . . Today: 2B Marlon Anderson (41), SS Ruben Amaro Sr. (79) . . . Wednesday: RHP Ray Semproch (74) . . . Thursday: INF Randy Ready (55) . . .
Monday: OF Reggie Taylor (38). 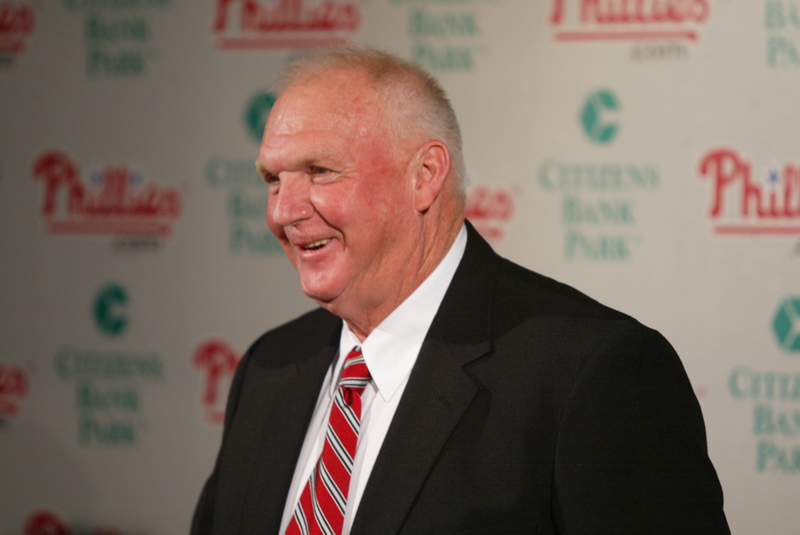 A belated Happy Birthday to Charlie Manuel, who’s celebrated on Sunday. Here’s a picture from the day he was signed as the Phillies 51st manager following the 2004 season. Who was on the mound for the final out when the Phillies clinched the NL East in 1993? The date: September 28. The scene: Three Rivers Stadium. The score: Phillies 10, Pirates 7. The winning pitcher: Bobby Thigpen (3-1). No, Bobby isn’t the answer. Clue: the answer will turn 53 this Sunday: Donn Pall. The last out was a 3-1 grounder: John Kruk to Pall, setting off a celebration. **Wall of Fame balloting will take place on this website later this month. **Alumni Day in Clearwater will be Saturday, March 21, at Bright House Field (Blue Jays). **Alumni Weekend at Citizens Bank Park will be July 31-August 1-2. Individual spring training tickets go on sale Thursday (Jan. 8). First workout for pitchers and catchers is February 19. The Phillies first wore uniform numbers starting in 1932. #1 that season was center-fielder George (Kiddo) Davis. The highest number: 30 by right-handed pitcher Ad Liska. Most numbers worn? Seven by infielder Granny Hamner (1, 2, 6, 17, 29, 33, 37) and Hall of Fame outfielder Chuck Klein (1, 3, 8, 26, 29, 32, 36).